Steering column from a 70's Peterbuilt. 1''. Steering box from a '91 Dodge 250 pickup. 3/4''. We used the complete front end and engine/trans from the Dodge, so the steering box was already in place and we're trying to make it work as-is. On Sunday, we decided to try to tackle the beginnings of the b-pillars. 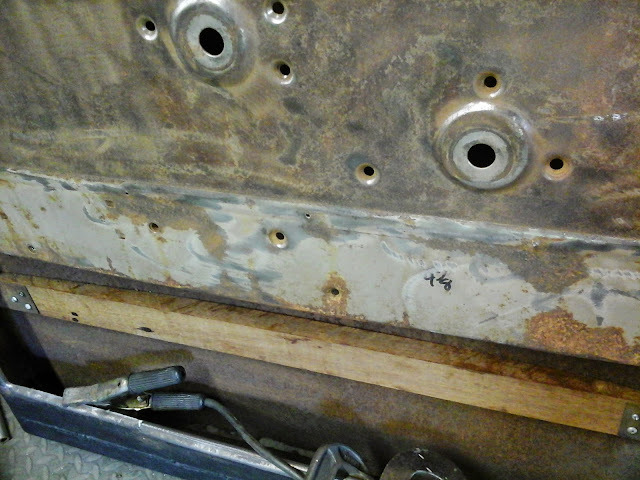 And, now, we have both front floor pans cut (not welded in yet as we plan to do that from underneath). Our power was out for the first half of the day Saturday (problems with the power station I guess), so we weren't able to get anything done Saturday - but we did a little Sunday. Although progress was slooow because it was so flippin' hot out! I got the pieces cut to frame in the passenger side floor and Brian welded them in place. 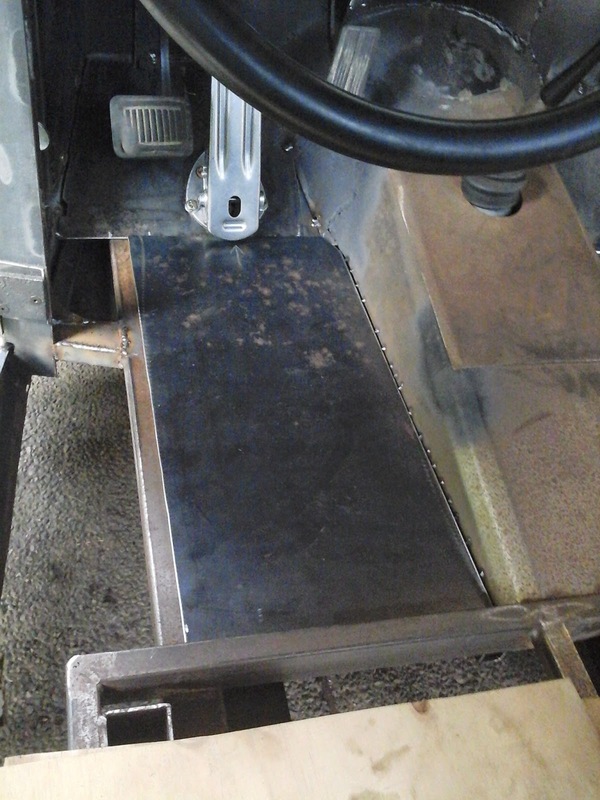 Brian got a section of the drivers floor pan cut out - wohoo! 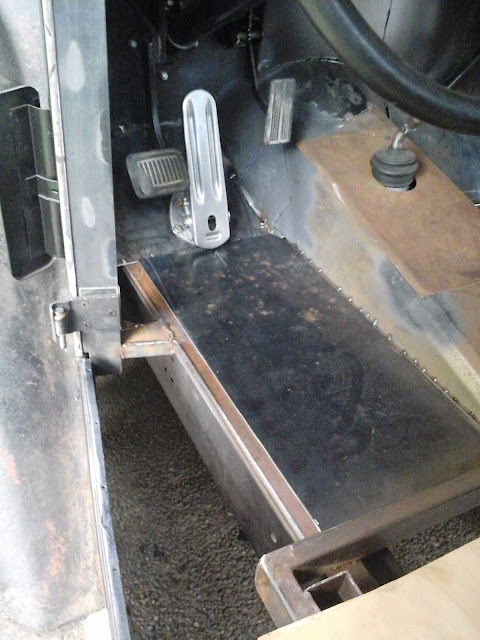 Pictures are kinda out of order, but this is after we got the foot pedal cleaned up. 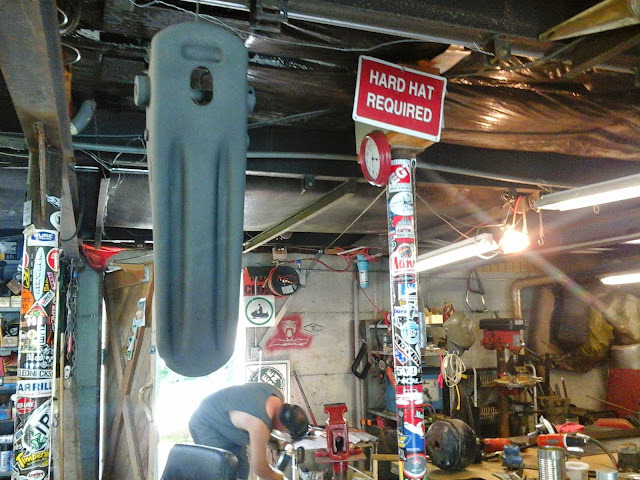 While I sanded, primed and painted the pedal itself. Now, if we could just find a rubber pad for it. I think Brian said it came out of an old Autocar that was a good friend of his dads. And, in an attempt to get some structural strength back in the door, I cut this piece of hardwood for it. I don't remember what the wood is called, but it's almost as hard as oak and is used for flooring (local lumber yard gave me a 6' chunk of 1x5 becasue the size made it unsellable) I ripped 2 pieces at 2'' wide, then marked the curve from a template I had made from an original piece of oak that was in the same spot. (It is 1'' thick in the center and less than 1/2'' on the ends to fit the gradual curve of the outside of the door). Our bandsaw has been neglected for many years, but I am sure glad we have it. It would have been really difficult to do on the table saw, LOL. I cut the curve on the bandsaw, then sanded the cut edge on the stationary belt sander. I cut out a matching piece for the other side while I was at it too, so all I have to do is sand that one to install it later. steering and pedals and brownie shifter, oh my! 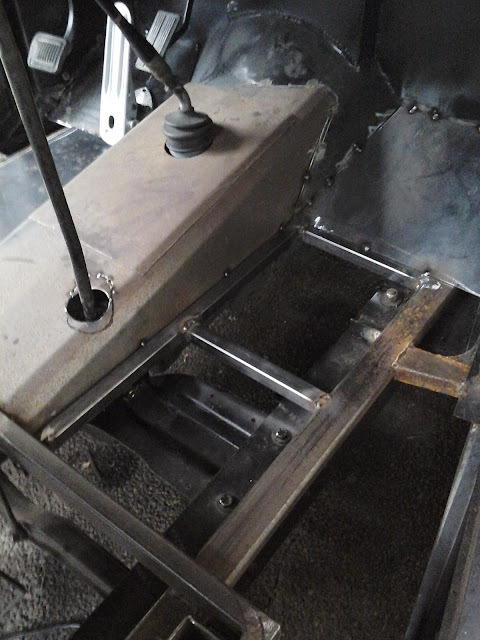 We finally have the steering column installed, and the pedals mostly installed, whew! Here is the clutch bracket - we salvaged it from the Dodge. (pic was before steering column bracket was done). It's pretty sturdy, but we plan to take it back out and make it even sturdier by boxing the top in. Our St.Bernard puppy, Lucy, ready to go for a ride too! Testing out the new pedals - the gas pedal will have to be lowered a bit unfortunately. 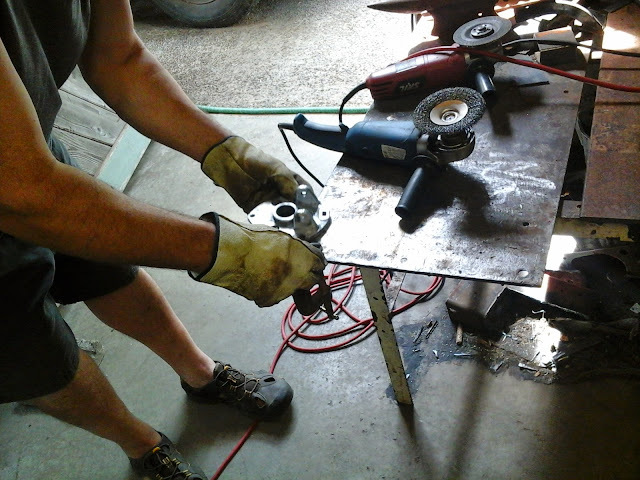 The brownie shifter installed! The brownie itself will probably be quite a ways down the road, but we wanted the shifter installed so we could finish the rest of the interior stuff around it.